This is one of the simplest and most powerful ways to handle social media marketing. If not having Instagram and Google+ integration is not a problem for you, this social media automation tool is well worth the price. I have a love-hate relationship with social media. While I understand it can boost my blog’s traffic and increase my social media following, I don’t like spending hours on it each day hoping to “make it happen”. All these social media automation tools help save time and effort and let me focus on doing more important things. I thought I’d seen it all — being a lazy social media marketer — until I discovered MeetEdgar. MeetEdgar, or Edgar as he is sometimes referred to, is a social media tool that can schedule, curate, and repurpose content so your social media accounts will never run out of updates. Unlike the other tools I mentioned, Edgar’s strength lies in his ability to keep publishing posts long after you’ve stopped feeding it content. Edgar is truly a master social media marketer. Is MeetEdgar Right For You? There are six main steps to setting up Edgar. Use the guide on the top of the page to help you complete each step. As I followed this guide, I discovered that you can skip through steps and come back to them later. However, it helps to follow along with this sequence so you understand how everything works together. MeetEdgar’s setup is not a quick one, as you can see from the list above. You’ll need to take your time in each step and click around to test every function. But once you get it, you can rest well knowing that all of your tedious social media tasks are handled. This may be a deal-breaker for some people. Other social media management apps like Buffer, Hootsuite, and CoSchedule offer more social media channels like Google +, Pinterest, and Instagram. If you absolutely need these other networks for your social media campaign, then stop right here and look for other options. MeetEdgar’s support page says they don’t have immediate plans for integrating Google to their service. They also explained why they can’t support Instagram due to its limited API access. But the good news is that you can add up to 25 social media accounts with MeetEdgar. Once you connect your Facebook account, Edgar can see your Facebook Pages and Groups, which you can add as separate units. With LinkedIn, you can connect a LinkedIn personal profile and any LinkedIn company profiles under that account. Adding an account in MeetEdgar is pretty straightforward. Click on the network and log in with your credentials for authorization. Once your accounts are connected, you’ll see them under your dashboard’s Account tab. 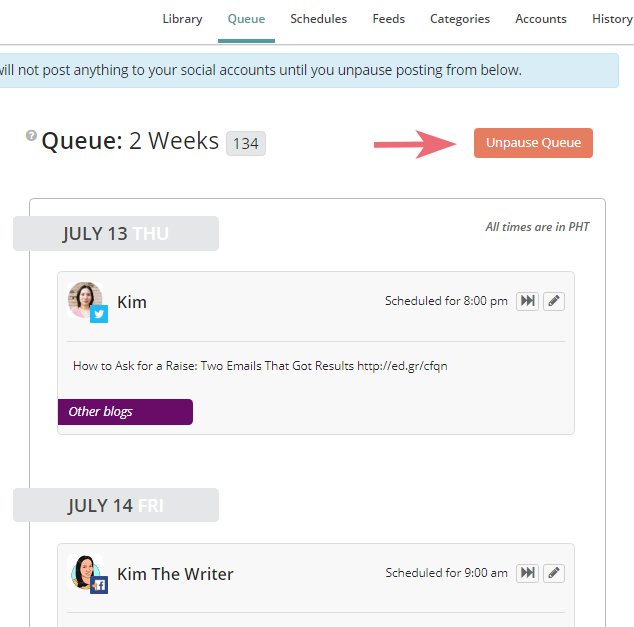 Every time you schedule a post, you’ll need to choose one or more of your connected accounts. The Add Content button is located at the top right corner of the MeetEdgar dashboard. Clicking on this button will get you to the content editor page. Here, you can put in links, images, and videos to add to your queue. On the left panel, you need to select which accounts will be used to post the content. 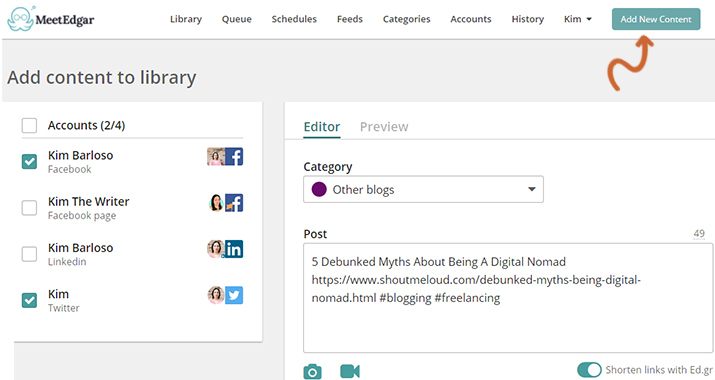 Under the Editor tab, you can assign a category for your content, and then put the content itself in the Post field. By default, Edgar has six categories already added when you start. You can delete these and add your own by going to the Categories tab. The “Use Once” category is handy for scheduling one-off posts. These are pieces of content that you don’t want to get posted more than once. Every content you schedule in MeetEdgar needs to be assigned to a category, so make sure you have a clear plan on what types of content you want to post. 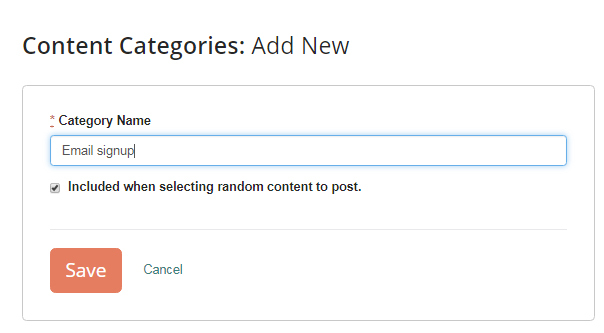 When adding a new category, you have the option to include or exclude it in “random” posts. We’ll discuss random posts in a minute. If you want to check how your content will look like once it’s posted, switch over to the Preview tab. You can change accounts from the drop-down list to see different previews. Links will appear as their full version in preview mode, but they will be shortened (using Edgar’s own link shortener) once posted on the network. The last step to adding new content is to give it a posting schedule. 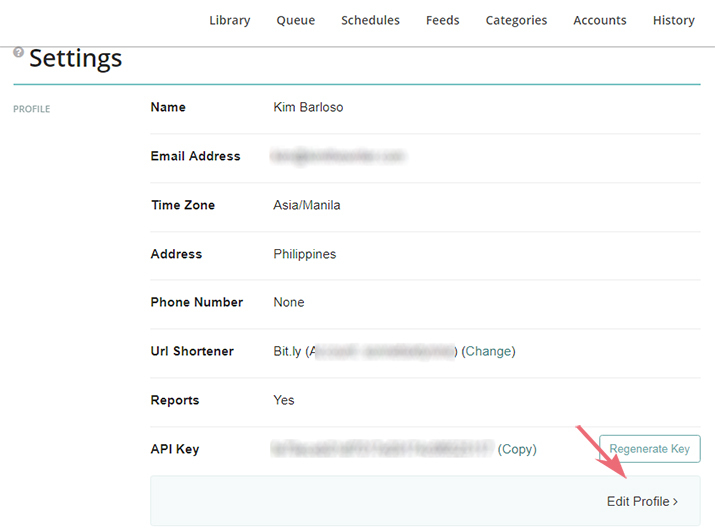 Expand the Schedule settings area below the content editor to set the time and date for the post. You can also choose to “expire” the post after a given time and date. 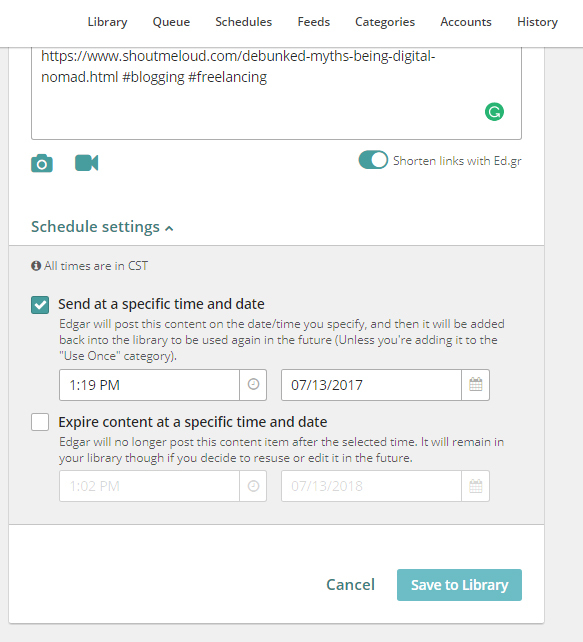 Not choosing the Expire content option will prompt Edgar to publish the post at the time and date specified and put the content in the Library for posting again in the future. Don’t forget to click Save to Library to complete the process. Every piece of content you add and schedule goes to the Library. You can view, delete, and edit all updates here. 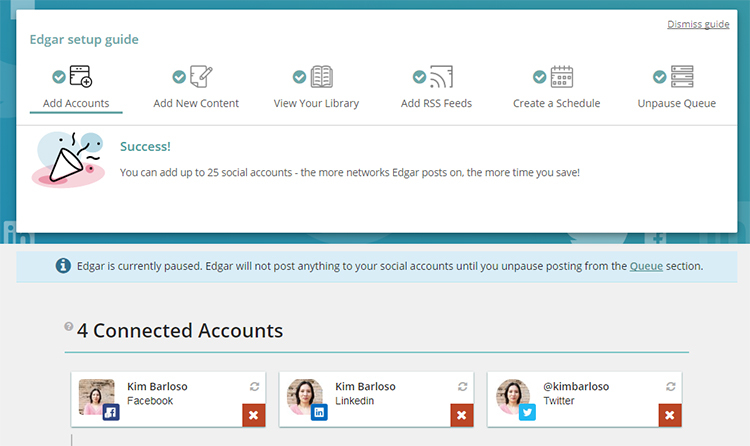 Updates can be filtered by category or by social network account. The number beside the main “Library” header indicates the total number of updates added so far. The numbers beside the categories stand for the number of updates included in that category. Editing updates in the Library can be done individually using the control buttons on the top right corner of each content box. The “History” button will bring you to a Content Performance page for that specific content. That page shows how many times the content was shared and on which social networks. The “Edit” button allows you to change or delete the text and image of the content. The “Delete” button takes the content away from the Library and won’t be posted again. Bulk editing is also an option. Click Bulk Actions on the top of the content list and select Edit. In this mode, all content will be listed, with options to change their categories and accounts. The more content you have in your Library, the more diverse your posts will be. This is, in my opinion, MeetEdgar’s best feature. 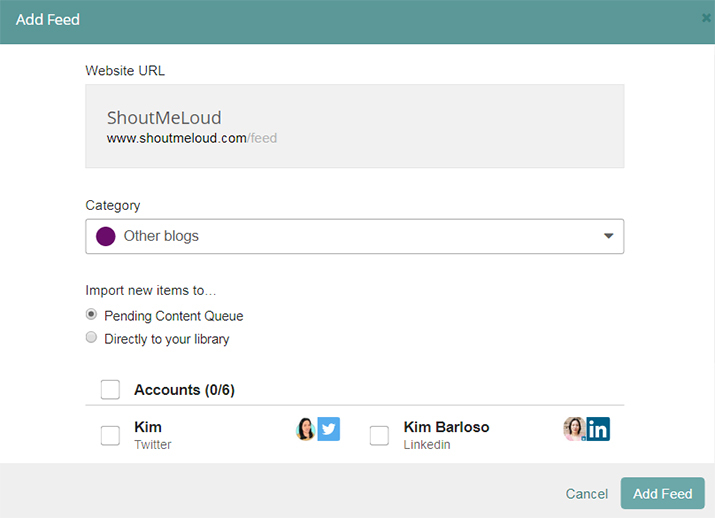 It’s the best way to curate content for your social media posts without too much work. Read about RSS Feeds here. 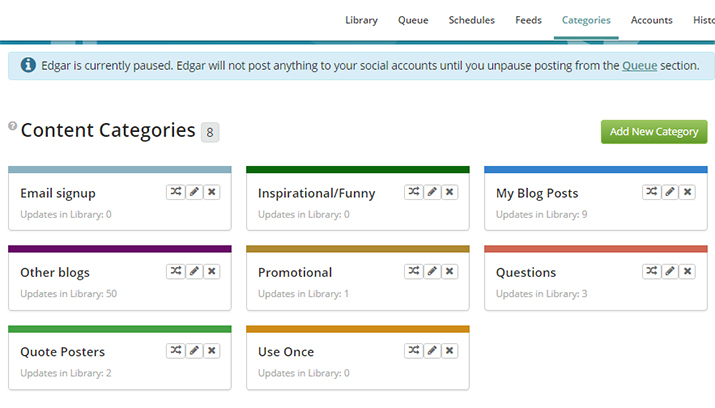 Go to the Feeds tab, then click Manage All Feeds on the left panel, and click Add Feed. The next window will let you add any website, and Edgar will find its feed. 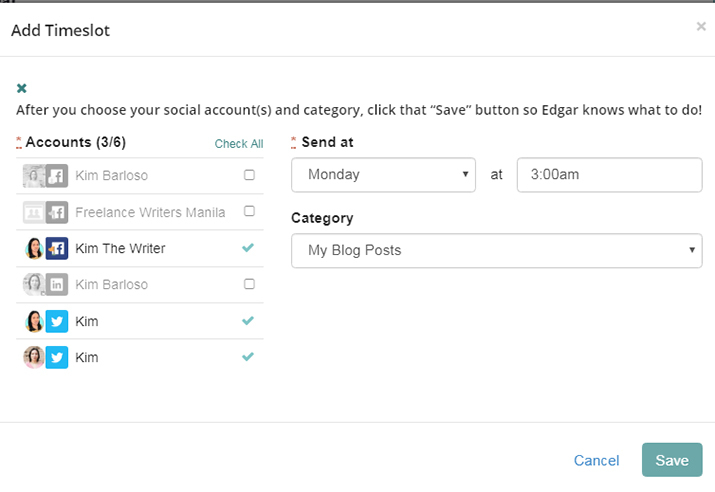 When Edgar locates the feed, you can then customize your feed options. Assign a category and social network to the feed. 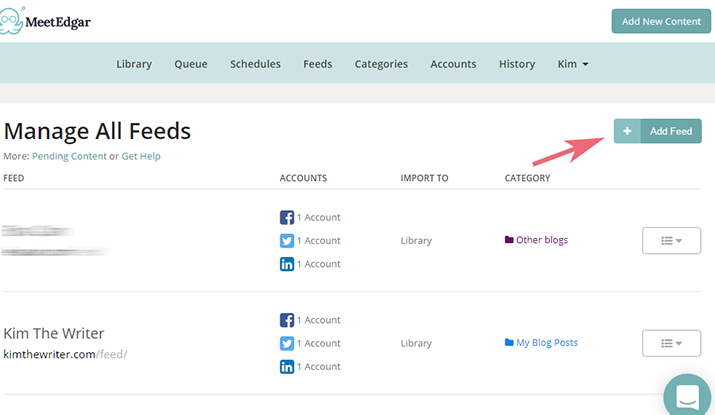 Feed items can be sent straight to the Library or to a Content Queue for screening. Click Add Feed to complete the process. If you want to screen feed content before sending it to the Library, you can go back to the Feeds page to view items under Pending Content. Here, you can approve or reject items either individually or by batch. There’s also an option to edit a feed item. This leads you to the content editor and scheduler, which we discussed in step 2. In step 2, we learned how you can schedule content for future publishing. 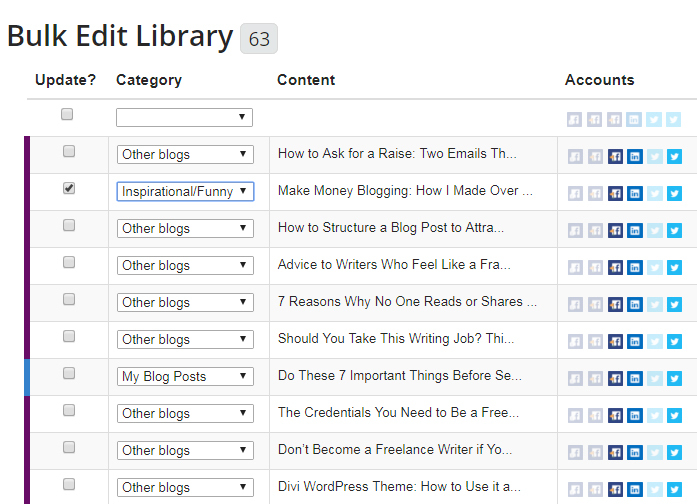 However, you can also create a general posting schedule which applies to the categories you’ve created. This way, you don’t have to schedule every piece of content that you add to the Library. 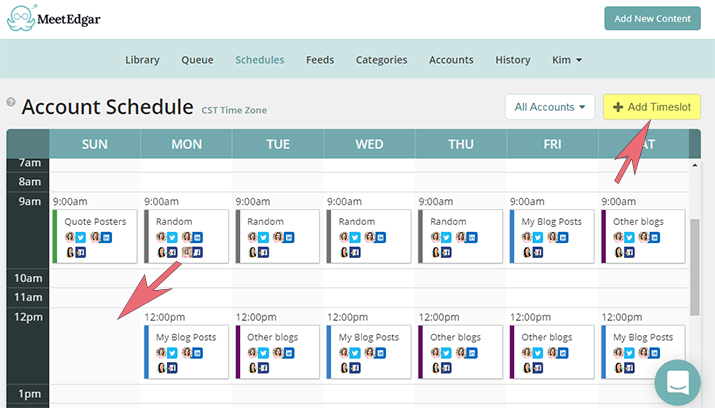 Before adding a schedule, check your profile and make sure it has the correct time zone. You can do this by clicking on your account name and going to Settings. In the Settings page, you’ll see the “Time Zone” field. Click on Edit Profile to change it. 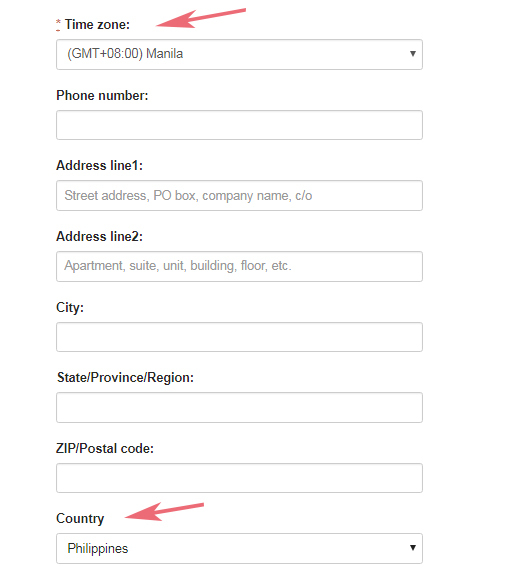 On the next page, change the time zone, and make sure you also have selected the correct country. 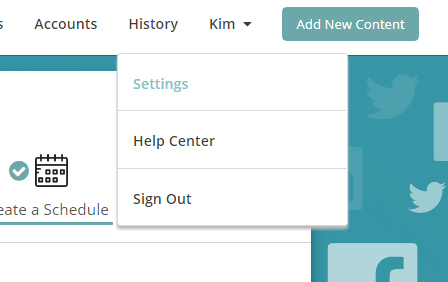 Save the changes and go back to the Schedules tab to start adding schedules. 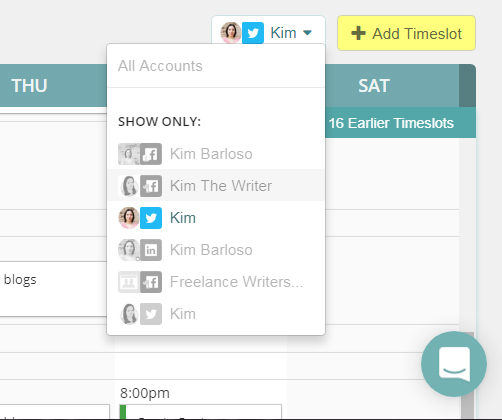 In the Schedules tab, you’ll see a calendar where you can add time slots for each day of the week. 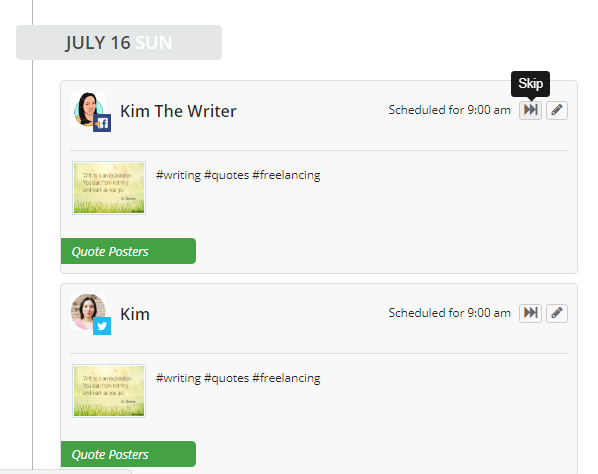 You can either click on Add Timeslot or a blank slot on the calendar to add a posting schedule. If you want to add a time like 8:00 am or 9:00 pm, then clicking on the blank slot from the calendar makes more sense. The Add Timeslot button is used for a more specific time like 12:15 am or 4:31 pm. On the pop-up window, specify the day and time (if you clicked on Add Timeslot), select your social media accounts, choose a category, and click Save. You can add a total of 1,000 time slots into your schedule. If you only want to see the schedule for a specific social media account, you can apply a filter on the top-right corner of the calendar. This filter comes in handy when you want to know how much content you have scheduled for each social network. The “queue” is the sequence of your posts as scheduled. Edgar queues content in a last in/first out order. This means that newly added content goes to the top of the queue. As a default, your queue is paused to give you time to set up. When you complete the first five steps, then you’re ready to unpause the queue. Go to the Queue tab and click Unpause Queue. Doing this will publish all content at the scheduled times. There’s an option to skip or edit any content in the queue. Skipping a piece of content in the queue will move the next post in line to replace it. Edgar is programmed to distribute content evenly to the queue. The more updates you add, the more diverse the content will be. Your budget (Edgar costs $49/month). 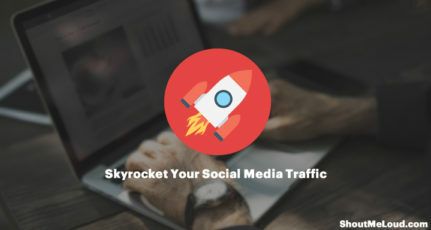 How important it is for your traffic to increase. How serious you are in maintaining a consistent social media presence. How much content you have on your blog/website. How much you hate spending time on social media things. You might do fine without this tool if you don’t mind spending more time than usual on social media. 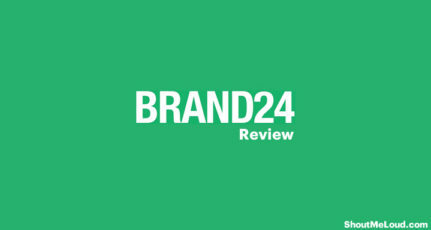 There’s also the issue of not having social networks like Google +, Instagram, and Pinterest integrated with this service. If these networks are vital for your social media campaign, then Edgar definitely isn’t for you. On the other hand, if you think this looks like a huge time-saver (and it definitely is), then you can try Edgar for $49/month. You will probably find that Edgar’s powerful features are worth the investment. I recommend adding as many categories and content as possible so your updates won’t appear “recycled” after just a few days. This is why you have to be creative with the kind of content you create as well as those that you get from other sources. Edgar is a great social media tool that is dedicated to seeing you succeed. He knows you would rather do something else, so he makes things super easy for you. With this tool, you won’t ever have to post anything twice. It’s half the effort with at least double the results! Have you used Edgar before? What are you doing with all that free time you used to spend on social media marketing? Let me hear your experiences in the comments below! Ahh, well-written article. 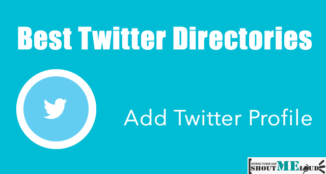 MeetEdgar social tool may be good but I feel it should have more option to add more social accounts like others. I agree. I hope it adds more networks in the future. is there any free or alternative plugin available out there to done the job ? Hi Nayan! You can check out SocialJukebox for a free alternative, but its features are limited. Almost all free social media automation tool like Buffer, Hootsuite have free versions, but they might not deliver the best features. Something new to know this time. Thanks for sharing Edgar. You’re welcome! I had fun writing this review. 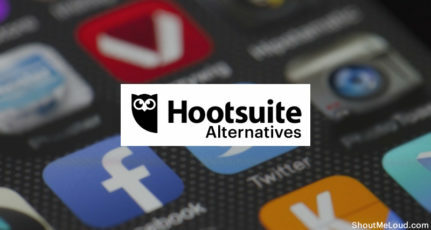 I am currently using Hootsuite for my social media automation tool. I havn’t heard of meetedgar. I am just curious to give it a try. Thanks for writing this awesome review about it. MeetEdgar , I haven’t tried this. But after reading about meetedgar will surely try this… And the steps are explained so well. Thanks for sharing such a useful information..!! 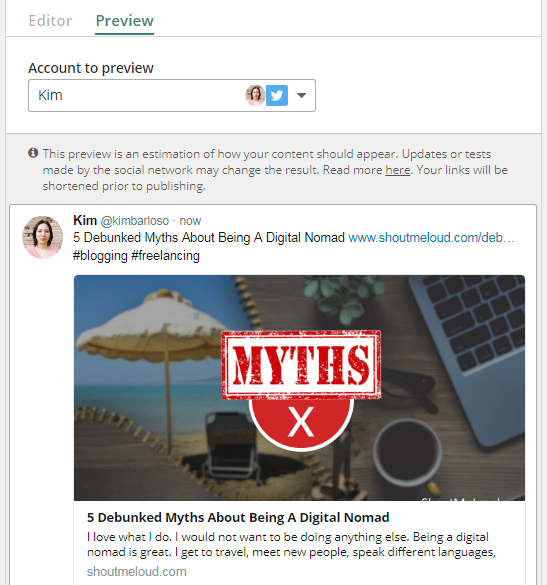 nice article Miss.KIM BARLOSO I want to know which is the best and free tool for the social media automation. Hootsuite or Buffer. 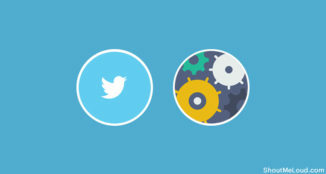 Seems like a very nice social media automation tool and sheduler. Would give it a try and see how well it would convert. Great Post. Do have a nice day! well-written article. MeetEdgar social tool may be good but I feel it should have more option to add more social accounts like others. It means you can’t change/delete/alter any part of the link when posting to a Facebook page/group. This might be because of a recent Facebook security update and MeetEdgar is simply abiding by the rules. Nice article! 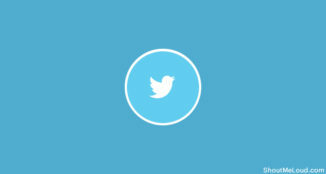 Currently I’m using Buffer social media automation tool. Great information about MeetEdgar tool. Please, let me know is it paid tool or free ? It’s not free, but I think you can get a 14-day trial when you sign up. After that it’s $49/month. 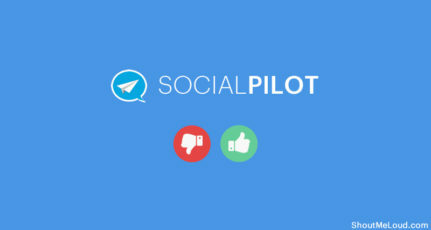 You should look at SocialPilot. They also have a free plan I believe. Very helpful article. Thanks a lot for sharing it with us, i just hoped it was free for more then 14 days, at least for 1 month. Thanks a lot Kim. Nice Article Kim. I would like to ask you that is there any free service that automates tasks for Instagram.